Experiments that were created in E-Prime 1.2 and 2.x can be upgraded into E-Prime 3.0 with little need of modification. However, while new experiments take advantage of newer functionality and defaults, experiments that are upgraded do not include some of the newer features in an effort for them to perform the way they did in previous editions of E-Prime. Once the need to maintain functional consistency ends, primarily when a continuing study is completed, then an experiment author can take advantage of E-Prime 3.0's new features in an upgraded experiment by explicitly selecting various features on the relevant objects. 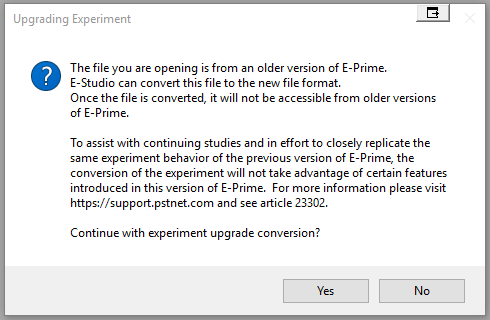 All experiments created in a previous version of E-Prime will be prompted to upgrade to an E-Prime 3.0 experiment file (.es3) upon opening.